Thimble Peak is located in the Grapevine Mountains in the northern part of Death Valley National Park. It’s a great desert peak, with an imposing looking summit block. From a distance, it’s not obvious how to get up the peak, but as you get closer the route reveals itself. It’s a fun climb, well worth the effort. After a great climb of Bridge Mountain the day before, I made the drive to Beatty, and then up Titus Canyon Road to the trailhead at aptly named Red Pass. It was after 11pm by the time I parked the car, folded down the back seats, and curled up for a short night of sleep. The next morning, I was on my feet by about 7:30am, making my way up the unrelenting path from Red Pass. With other plans later in the day, I tried to hustle, but kept getting distracted by the neat desert scenery. Even with the distractions, I made it to “Thimbles Shadow Peak” (Peak 6140’) in about 30 minutes, where I had a great view of the route ahead. The steep southeast face of Thimble Peak looked very impressive from this vantage point. I dropped down to the saddle and then kept following the faint tread up Thimble’s northeast ridge. The trail climbed steadily, and there were just a couple easy scramble moves to partake of below the highpoint. The summit of Thimble Peak provides some great views in all directions. With the sun still pretty low in the sky, the lighting was great and help bring color to the desert landscape. 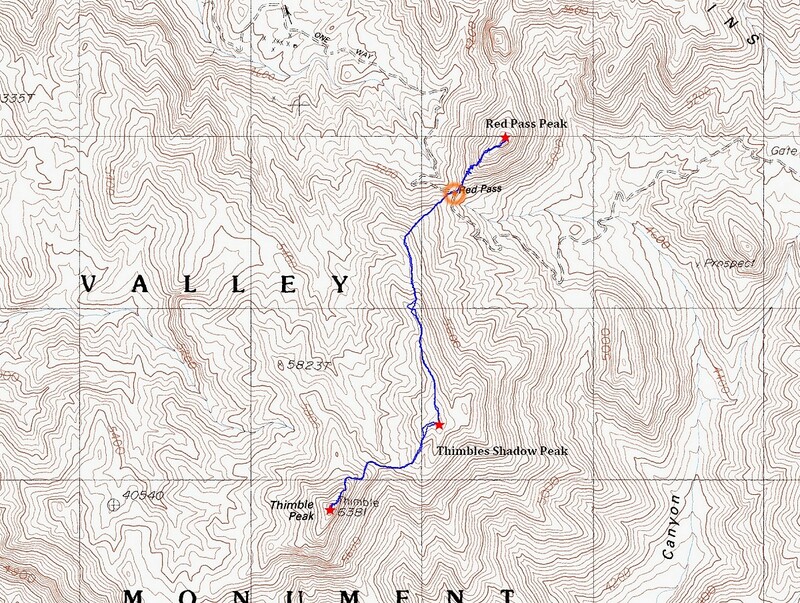 My main interest was the views of Corkscrew Peak to the southeast, which would be another objective later in the day. Once I had soaked in the views for a while, I then retraced the path back to the car, covering the 3.5 miles round trip in about two hours. The distance and time was shorter than expected, so I decided to continue on to Red Pass Peak (Peak 5860’) on the other side of the road. The route to Red Pass Peak was much steeper than the trail to Thimble Peak. There were a couple steep scrambly sections, and I usually errored to the left (north) side of the ridge when in doubt. It wasn’t long before I was on the summit, where I enjoyed a PB&J for breakfast while soaking in the views. The downclimb back to the car was trickier than the climb up in my opinion. All in all, the three peaks took about 3 hours round trip, covering 4 miles and 2400’ elevation gain. Next up was a neat drive down through Titus Canyon, followed by a climb of Corkscrew Peak in the afternoon. Map of the route, 4 miles and 2400' total elevation gain round trip. My overnight parking spot at Red Pass. Looking back down on the trailhead. First good view of Thimble Peak. Me and Thimble Peak from Thimbles Shadow Peak. Interesting desert plant, about the size of a baseball. Looking across at Corkscrew Peak from Thimble Peak. Me on the summit of Thimble Peak. Death Valley from Thimble Peak. Cool rock formations on the way up Red Pass Peak. Thimble Peak and Thimbles Shadow Peak from the summit of Red Pass Peak.